We all by now know that Spring has a Samsung 4G LTE mid-level smartphone on the way, but the details are very minimal, at least until now. Thanks to the Android Central gang, we’re know able to see what the specifications on the Samsung Galaxy Victory 4G LTE is. The Galaxy Victory will be powered by Android 4.0 Ice Cream Sandwich (along with all of the TouchWiz features that you would find on the Galaxy S III) and will be featuring some fairly nice specs such as a 1.2GHz Snapdragon S4 Lite chip, a 4 inch screen with a 800 x 480 resolution, 4 gigs of on board storage and a 5 mega pixel camera with a 1.3 mega pixel front facing camera. These features are slightly dated and isn’t your “top of the line” technology, but it does seem like it will get the job done fairly easily. 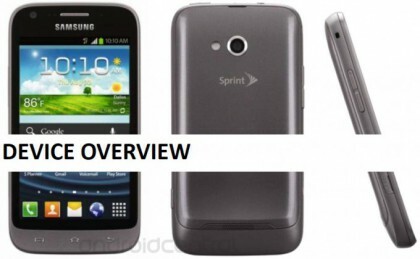 Both Samsung and Sprint are still on the download with the actual device, but it’s a possibility that we have an idea as to when the handset is going to be released for consumers to purchase. Android Central was able to obtain some internal training documents that has highlighted Sprint reps training for a September release of the handset. That also just happens to coincide with the start of the Fall season, which means this could possibly be apart of the September promotional program. Don’t expect this handset to look like an iPhone either, surely Samsung Electronics has learned its lesson for the U.S markets after last weeks verdict in the San Jose court. If the picture above says anything, it looks like we’ll be seeing a bumpier design than the slim and flat designs of the Galaxy S II and most previous Samsung devices. Looks aside, this is going to be a fairly decent phone for those looking for something on the cheaper side. Of course, a price hasn’t been seen yet, so take that prediction with a grain of salt. Are you possibly interested in getting the Samsung Galaxy Victory 4G LTE smartphone? While there has been no exact words on the handsets release date, it does look to cater to those who just want something “that works” and is a bit smaller than the Galaxy S III for those who aren’t fond of larger screens. Also, if you’re interested in taking a look at the training documents, be sure to hit the source link below and there should be 26 different training slides for you to look at (the slides give an overview of the Galaxy Victory handset with things like NFC, camera placement and so on). Here’s a real question though. Would you be willing to trade in your current phone to get the Samsung Galaxy Victory 4G LTE or do you think what you have currently is better and/or just works for you? While I don’t think it’s worth trading in a phone (unless you have a really old phone) to get this, you may think so.